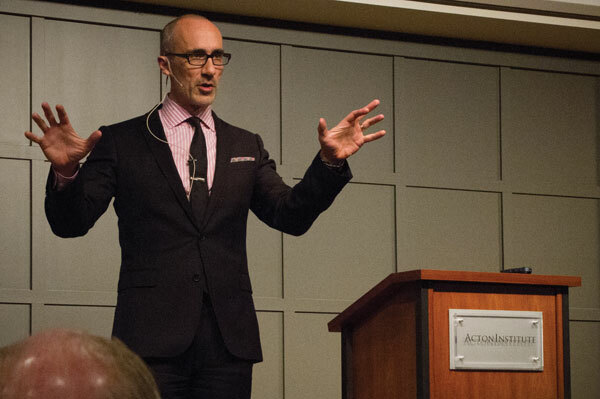 AEI President Arthur Brooks explains the connection between free enterprise and happiness at a Jan. 29 event in Grand Rapids. The Mackinac Center hosted two popular events spreading the word about limiting government — and being happy while you do it. In January, we teamed up with the Acton Institute in Grand Rapids to host American Enterprise Institute President Arthur Brooks. The lecture took place in Grand Rapids at the beautiful Acton building. Brooks was a college professor before becoming the president of the Washington D.C.-based think tank that is one of the largest in the country. As an academic, his prominent research area was about happiness. 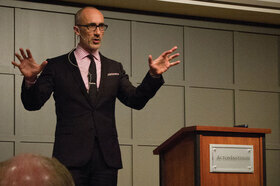 His lecture “A Formula for Happiness” discussed the intersection between work, happiness, and human flourishing. 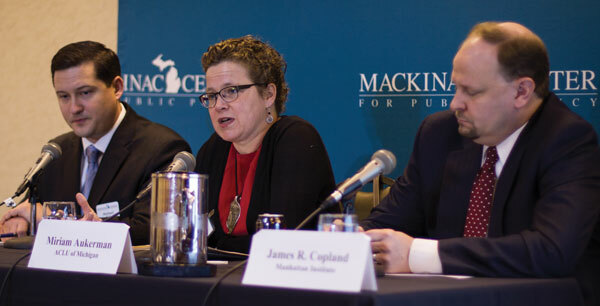 Mackinac Center Executive Vice President Michael Reitz (left), ACLU of Michigan Attorney Miriam Aukerman (center) and Manhattan Institute's Center for Legal Policy Director James Copland (right) serve as panelists for a Lansing event on Overcriminalization Feb.11. Brooks noted that the percentage of Americans who are unsatisfied with their lives has been increasing in recent decades — despite living in the most prosperous country in human history. He said that there are generally two types of goals that people have when they start out their working life – intrinsic and extrinsic. Intrinsic goals are things based on relationships, like wanting to get married or have a better relationship with family or knowing God better. Extrinsic goals include wanting to be richer or more famous or more respected. Brooks said that studies that follow people for an extended length of time show two things: That the goals are usually met and that people striving for intrinsic goals are happier. 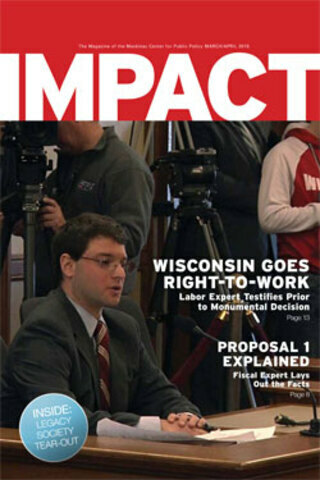 The other event took place in Lansing and discussed Michigan’s vast criminal code. The panel featured Michael Reitz, executive vice president of the Mackinac Center; Miriam Aukerman, a staff attorney for the ACLU of Michigan; and James Copland, director of the Manhattan Institute’s Center for Legal Policy. Michigan's criminal code, say experts, is vast, outdated and growing, and putting citizens at risk of committing at least a crime a day. Reitz said one main problem is that the Legislature spends most of its time adding new laws and very rarely repealing old ones. He said Michigan's criminal statutes suffer from three defects: The code is so overpopulated that people cannot keep track of the number of laws on the books, laws regulating to such a degree that the punishment no longer fits the crimes, and criminalizing conduct that most people at a gut level would agree is not something that is wrong. “A state’s criminal code should protect individual liberty and private property — not be a tool to regulate every part of human conduct,” Reitz said. Aukerman noted that people serve significantly more time in prison in Michigan than in other states for the same crimes. Just making Michigan the average of other states would save $530 million annually in correction costs. Copland said the biggest issue may be the growth of the regulatory state. More and more crimes are established by administrative agencies rather than elected officials. “We should worry about innocent people getting ensnared in this criminal justice system ... for something in which it is very difficult to know if they committed a crime,” Copland said. Reitz said the problem with having so many laws is that “everyone is a criminal” and government prosecution is more discretionary. Also, he added, civil society and the rule of law are eroded because individuals are selectively choosing what to obey and what not to obey.